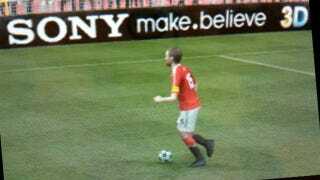 This isn't the first time Sony advertising has appeared in a football game on a Nintendo or Microsoft platform. It happens all the time. But there's something delightfully poignant about this particular case. Pro Evolution Soccer 3D, freshly-released for the freshly-released Nintendo 3DS, has - like its console siblings - the full suite of actual advertisements from Europe's Champion's League. Which includes Sony. While this has long meant ads for the PS2, PSP and PS3 being seen in Xbox, Wii and DS versions of the series, this one for Nintendo's new 3D handheld is just too good to ignore.